Scruffy121234 asked the Desktops forum to recommend benchmarking software. I'm assuming you don't want something that takes hours and costs hundreds of dollars, such as PC World's own Worldbench. So I'll stick to free options. I'm going to start by recommending one program that Scruffy rejected in the original post: Novabench. It's easy to set up and get going, and to use. Unlike most free benchmarking tools, it's not a marketing device for a commercial product, so you don't have to put up with crippled features or frequent nags. And it runs through its tests very quickly--taking about a minute. In fact, Scruffy complained about Novabench being too fast. He couldn't believe that it could properly test hard drive performance in the ten or so seconds it takes to do that. I ran some tests to find out, and came to the conclusion that its HDD results were accurate enough to be useful, but not authoritative. You therefore might want to augment Novabench's tests with HD Tune, an excellent and free hard drive diagnostic and benchmark tool. 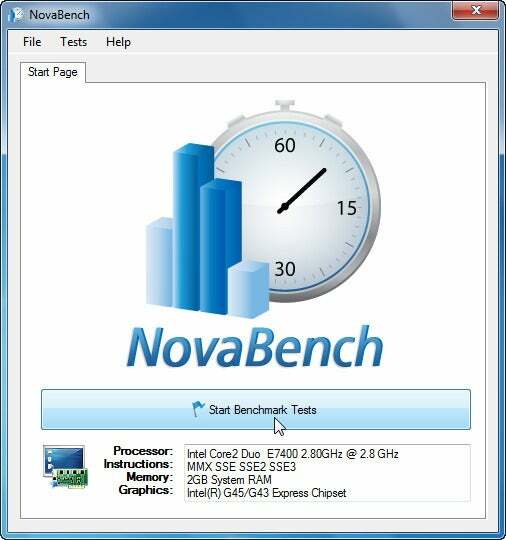 When Novabench finishes its tests, it provides you with concise results for RAM, the CPU, graphics, and the hard drive. You can save the results and compare them online with other recently-tested systems. If you want something more powerful and, well, geekier, try SiSoftware Sandra Lite. This free diagnostic and benchmarking tool from Great Britain offers a bewildering number of options and results. Expect a significant learning curve to get anything out of it. Unlike Novabench, Sandra is the limited version of a commercial program. Quite a few of its many features won't work in the free Lite version. My thanks to Waldojim for reminding me, in the original forum discussion, that HD Tune does benchmarks as well as diagnostics.